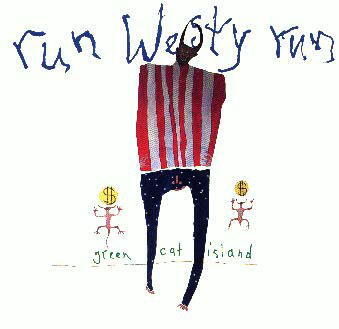 Run Westy Run's debut Twin/Tone release, entitled Green Cat Island, was recorded in the spring of 1990 in Athens, Georgia. It was produced by the band and longtime friend and supporter Pete Buck (you know, that R.E.M. guy). Pete's cohort Mike Mills played accordion on "Last Swallow," the band's piratic tune. Pete also coproduced their debut album with Grant Hart, "Hardly, Not Even", which was released in 1987 on SST. In 1988 the band released a self-titled album, also on SST. The band was formed around the nucleus of lead guitarist Terry Fisher and three Johnson brothers (Kirk on vocals, Kyle on bass/guitar, Kraig on guitar/bass) in the mid-80's. Drummer Dan Davis joined in 1989. Released by Twin/Tone Records September 20, 1990. The album sold 940 vinyl copies, 2,244 cassettes and 2,333 CDs in the first two years of release. It is "out of print" in the vinyl and cassette formats. Twin/Tone continues to press the CD and sells it through Restless/Ryko.